Just like we learned in pitching and hitting, fielding requires extensive mental abilities involving eyes, brain, and body movements to accomplish the task. Some physical skills, such as speed, do play a part in catching, but its the calculations and estimating that our brain has to compute that we often take for granted. The fact that fielders are not perfect in this skill, (there are dropped fly balls, or bad judgments of ball flight), begs the question of how to improve? As we saw with pitching and hitting (and most sports skills), practice does improve performance. But, if we understand what our brains are trying to accomplish, we can hopefully design more productive training routines to use in practice. Once more, we turn to Mike Stadler, associate professor of psychology at University of Missouri, who provides a great overview of current fielding research in his book, "The Psychology of Baseball". One organization that does not take this skill for granted is NASA. The interception of a ballistic object in mid-flight can describe a left fielder's job or an anti-missile defense system or how a pilot maneuvers a spacecraft through a three dimensional space. In fact, Michael McBeath , a former post doctoral fellow at the NASA Ames Research Center, (now an associate professor at Arizona State University), has been studying fly ball catching since 1995, beginning with his research study, "How baseball outfielders determine where to run to catch fly ball". His team developed a rocket-science like theory named Linear Optical Trajectory to describe the process that a fielder uses to follow the path of a batted ball. LOT says the fielder will adjust his movement towards the ball so that its trajectory follows a straight line through his field of vision. Rather than compute the landing point of the ball, racing to that spot and waiting, the fielder uses the information provided by the path of the ball to constantly adjust his path so that they intersect at the right time and place. The LOT theory is an evolution from an earlier theory called Optical Acceleration Cancellation (OAC) that had the same idea but only explained the fielder's tracking behavior in the vertical dimension. 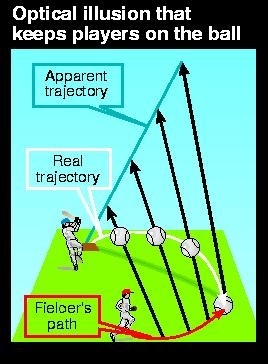 In other words, as the ball leaves the bat the fielder watches the ball rise in his field of vision. If he were to stand still and the ball was hit hard enough to land behind him, his eyes would track the ball up and over his head, or at a 90 degree angle. If the ball landed in front of him, he would see the ball rise and fall but his viewing angle may not rise above 45 degrees. LOT and OAC argue that the fielder repositions himself throughout the flight of the ball to keep this viewing angle between 0 and 90 degrees. If its rising too fast, he needs to turn and run backwards. If the viewing angle is low, then the fielder needs to move forward so that the ball doesn't land in front of him. He can't always make to the landing spot in time, but keeping the ball at about a 45 degree angle by moving will help ensure that he gets there in time. While OAC explained balls hit directly at a fielder, LOT helps add the side-to-side dimension, as in our example of above of a ball hit to the right of the fielder. More recently, McBeath has successfully defended his LOT theory here and here. The OAC and LOT theories do agree on a fundamental cognitive science debate. There are two theories of how we perceive the world and then react to it. First, the Information Processing (IP) theory likens our brain to a computer in that we have inputs, our senses that gather information about the world, a memory system that stores all of our past experiences and lessons learned, and a "CPU" or main processor that combines our input with our memory and computes the best answer for the given problem. So, IP would say that the fielder sees the fly ball and offers it to the brain as input, the brain then pulls from memory all of the hundreds or thousands of fly ball flight paths that have been experienced, and then computes the best path to the ball's landing point based on what it has "learned" through practice. McBeath's research and observations of fielders has shown that the processing time to accomplish this task would be too great for the player to react. OAC and LOT subscribe to the alternate theory of human perception, Ecological Psychology (EP). EP eliminates the call to memory from the processing and argues that the fielder observes the flight path of the ball and can react using the angle monitoring system. This is still up for debate as the IPers would argue "learned facts" like what pitch was thrown, how a certain batter hits those pitches, how the prevailing wind will affect the ball, etc. And, with EP, how can the skill differences between a young ballplayer and an experienced major leaguer be accounted for? What is the point of practice, if the trials and errors are not stored/accessed in memory? Of course, we haven't mentioned ground balls and their behavior, due to the lack of research out there. The reaction time for a third baseman to snare a hot one-hopper down the line is much shorter. This would also argue in favor of EP, but what other systems are involved? Arguing about which theory explains a fielder's actions is only productive if we can apply the research to create better drills and practices for our players. The LOT theory seems to be getting there as an explanation, but there is still debate over EP vs. IP . So many sport skills rely on some of these foundations, that this type of research will continue to be relevant. As with pitching and hitting, fielding seems to improve with practice.